Disconnecting from the hustle and bustle of everyday life almost seems foreign these days. Why would someone want to say goodbye to modern day conveniences and live momentarily off the grid? This was exactly my experience at the Feynan Ecolodge, hailed as one of the best 25 ecolodges in the world by National Geographic Traveler Magazine. The Feynan Ecolodge is about minimizing environmental footprints, operating in harmony with its habitat and providing guests with extraordinary unique life experiences that will forever be engrained in them for a very long time. Also lauded as 'Jordan’s great escape', the 26 room environmentally friendly lodge proved to be a game changer in regards to how I now value time and life. This solar powered lodge offers the most developed eco-experience in Jordan, producing most of its energy needs from the sun while being lit by candles and stars at night. Furthermore, the revenue generated by the lodge not only helps with conservation efforts and the protection of endangered species around the reserve, but also benefits the surrounding local communities as all of the employees working at the lodge live in nearby communities. As brief as my stay was, this adventure gave me the opportunity to embrace life’s fundamentals. It all started with an interesting ride through the rugged terrain of the South-Western edge of the Dana Biosphere Reserve. As we made our way to the lodge I could see nothing but a vast landscape of endless rose coloured canyons and local herdsmen walking the trails tending to their goats. After an afternoon of travelling, we finally reached the lodge and were greeted with the warmest of hospitality. The lodging, with its rustic-chic ambiance, gave me the impression of living in a past life. 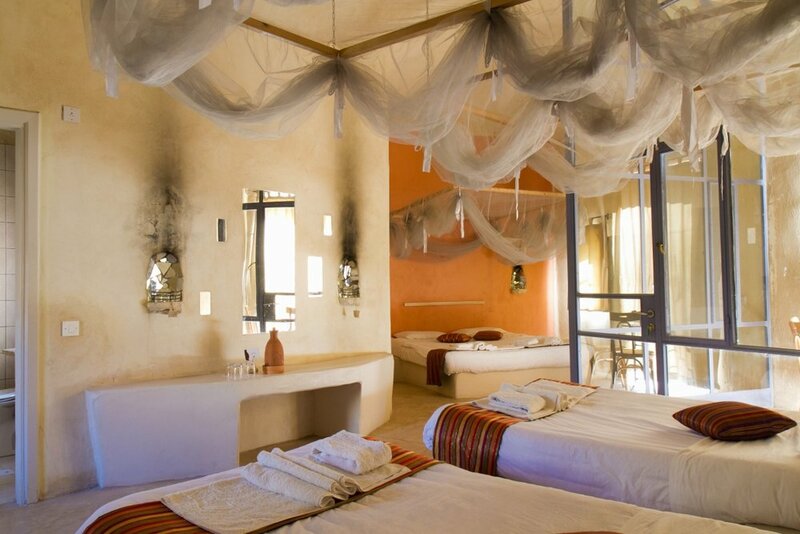 My room was charmingly adorned with candles, a suspended bed decorated with beautiful lace mosquito netting, a private ensuite and an impressive view of the canyons. Once settled in, we enjoyed a tasty lunch followed by a guided sunset hike. The food offerings at Feynan are nothing short of delicious. Even though there are plenty of goats nearby, the eco-lodge, in line with its conservationist philosophy, only serves vegetarian meals. During the beautiful hike, I was mesmerized by the most colourful of sunsets while enjoying a local tea brewed over an open fire all the while listening to one of the lodge’s very knowledgeable and friendly guides talk about Bedouin traditions and culture. The lodge offers a plethora of activities for their guests. Everything from hikes to historic copper mines, archaeological treasures and lush canyons to spending a day with a local Bedouin shepherd. One particularly fascinating activity is a local Bedouin community cross cultural exchange where guests learn about Bedouin traditions including coffee making, goat-hair tent making, kohl (i.e. eyeliner) and the preparation of traditional Arabic dishes with local chefs. I participated in a version of a cultural exchange in which Jordan's reputation of warm hospitality was exemplified as I was invited into a local Bedouin home to witness rituals of historical richness. Sitting in the goat-haired tent being offered coffee and learning of its significance with the Bedouin culture was not only very humbling but spiritually gratifying. I learned that the act of serving coffee amongst Bedouins is integral and bears much significance regarding communication, tribal negotiations and respect for the Bedouin culture. And if that wasn't enough for me to be in awe, we were presented with some of the best stargazing in Jordan. In order to ensure guests have the best views, you are taken up to the lodge's rooftop where mattresses are laid out so that you can lie down and get lost in the wonderment of the Jordan night sky. It's all in the details! 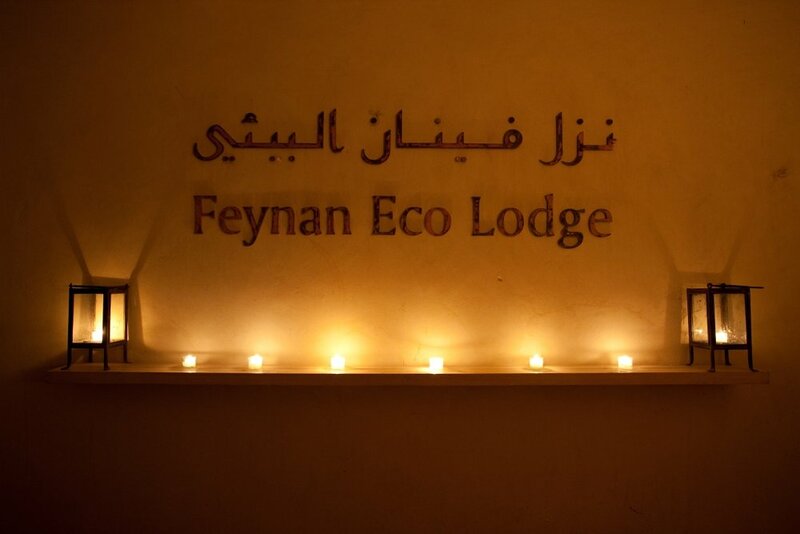 If your modern technology is an integral part of your everyday life, yet you’d like to experience a life where one is in touch with nature as well as their mind and soul, I invite you to disconnect at the Feynan Ecolodge. In fact, guests visit the lodge from all over the world to experience adventure, romance, tranquility, history and nature. For more information about the Feynan Ecolodge, please visit The Jordan Tourism Board (www.myjordanjourney.com) as it provides travellers with an abundance of information regarding Jordan’s captivating culture and exceptional experiences.